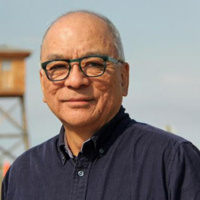 Abe will share the personal journey that led him to help reframe the narrative around the wartime incarceration of Japanese Americans — from resettlement in the Midwest, to redress for the injustice, to recovery of the story of resistance to that injustice. Throughout, he will relate the experience to that of those targeted in America today on the basis of race, religion or immigration status. Abe is a journalist and producer/director of the PBS documentary “Conscience and the Constitution.” He is currently collaborating on a graphic novel dramatizing the resistance to wartime incarceration, and blogs at Resisters.com. With Frank Chin, he helped create the first “Day of Remembrance” events, and helped launch Chin’s Asian American Theater Workshop in San Francisco. Abe was senior reporter for KIRO Newsradio in Seattle, and served as communications director for two King County executives and the King County Council. He has been published in Bloomsbury Review, Amerasia Journal, Frontiers of Asian American Studies and many newspapers. The lecture is being presented in collaboration with the college’s Phelps Scholars Program, Hope’s Asian Perspective Association, the Center for Global Engagement and the Department of American Ethnic Studies. Thanks to all at the Center for Diversity and Inclusion, HAPA, Phelps Scholars, and others, for hosting this wonderful event.